Not a whole lot going on this week. I've ridden my bike every day this week except today when I walked in from my wife's school. I needed to take her car to the tire shop to swap out the studded snow tires for the low rolling resistance summer tires. I had forgotten how quiet the new car was without the studded tires. And my running around this morning averaged 55+ mpg! Way more than the bike. No issues at all with the motorcycle this week except for the cloud of blue smoke in the garage when I started the bike before closing the garage door after pushing it outside. For those who hadn't dealt with airheads before, after shutting the bike off, you would normally lean the bike to the right for a bit so the oil could drain out of the left cylinder. If you don't do this, the oil will seep past the piston rings while parked on the side stand into the left combustion chamber. If you read the BMW forums, there are some that say that because of this, the side stand should NEVER be used. Sorry, I use it every day during riding season. 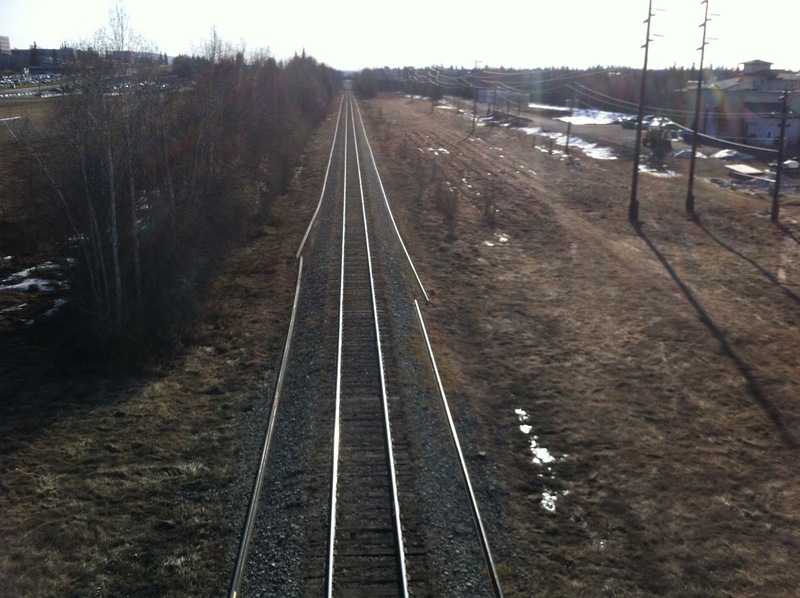 I was attracted to the train tracks this morning during my walk due to the new rails laying down next to the tracks. This is the only set of tracks coming into Fairbanks so I'm sort of curious how they plan to replace them without impacting the schedule. Tourist traffic using the train is a big deal since it is a pretty nice trip between here and Anchorage especially when it passed through (and stops at) Denali National Park. As you can see, almost all of the snow has melted with just small patches in the shady areas. Last Saturday, I participated in the Beat Beethoven 5K. The goal, for the competitive types, is to finish the course before before the last note of Beethoven's 5th symphony. The conductor of the Fairbanks Symphony starts the race with the first downbeat and there are speakers located though out the course so participants could hear the music and tell if they are on track. I'm not one of the competitive types, at least when it comes to running, and my goal was to enjoy the walk and get the t-shirt (this years design shown here). If you finish before the last note is played, you get a free concert ticket. I don't remember what my time was except that it was slower than last year. I thought that my time should be improving over the years. Tomorrow, I head to Washington D.C. for the week then stopping in OR to visit family on the way back for a couple of days. Richard, as a fellow Airhead owner/rider, I'd heard the same thing re oil seeping into the left jug if using the sidestand. Hence, I tend to always put mine on its center stand when parking it for a long time. 1983 R100RT. It is very difficult to get it up on the center stand compared to later years. So I only bother if I'm doing maintenance or long term storage. I usually have my snow tires mounted on extra rims so I change them myself. I don't think it's healthy for the tire to keep being mounted and unmounted every year, plus the time to make an appointment to take them in. My tires are also low rolling resistance Michelins. It makes quite a difference as compared to the snows when rolling down the road. Much quieter too. The hassle with a second set of rims is the TPMS (tire pressure monitoring system) that is now required on all 2012 model year cars. You have to code the sensors to the computer on the car so every wheel swap requires a visit to the dealer ($$$). I have heard about aftermarket sensors that allow you to clone the factory sensor id numbers. I will look into that between now and this Fall as well as a second set of wheels if this eliminates the need to visit the dealer. Yikes ! didn't know that. They are probably $100. per wheel, or more . . .
Yay! The bike is seeing some wonderful road time. It is a pretty neat event and is one of the fund raisers for the Fairbanks Symphony. My wife said that she is still waiting for her free ticket but I told her that it may be quite a wait. And, yes, it really feels great to be out on the bike even at 30°F. At least it has been sunny! The train tracks besides the tracks makes for an interesting view. It tricks the mind a little. Safe journey on your travels. Depending on when you get to Oregon you may even have warm weather. While walking over the tracks, my eye was drawn to what looked like two sets of tracks where there was only one before. It was a clear and sunny morning but the sky was really bright and by then it was above freezing. I get into PDX late Saturday night. Hopefully it'll not be raining. Well you learn some thing every day..I didn't know that thing about leaning the bike to get the oil out. Good to see you getting out and about. Many only use the center stand to avoid the embarrassment of leaving a cloud of smoke. I guess it isn't very politically correct. I forget to do it about a ¼ of the time.